Hoverflies, sometimes called flower flies, sweat bees or syrphid flies, make up the insect family Syrphidae. As their common name suggests, they are often seen hovering or nectaring at flowers; the adults of many species feed mainly on nectar and pollen, while the larvae (maggots) eat a wide range of foods. In some species, the larvae are saprotrophs, eating decaying plant and animal matter in the soil or in ponds and streams. In other species, the larvae are insectivores and prey on aphids, thrips, and other plant-sucking insects. The size of hoverflies varies depending on the species. Some, like members of the genus Baccha, are small, elongate and slender, while others, like members of Criorhina are large, hairy, and yellow and black. As members of Diptera, all hoverflies have a single functional pair of wings (the hindwings are reduced to balancing organs). They are brightly colored, with spots, stripes, and bands of yellow or brown covering their bodies. 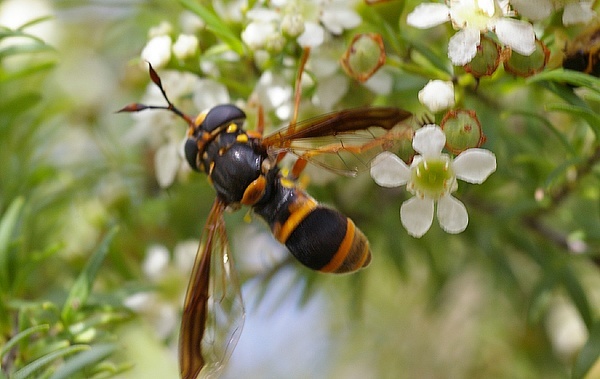 Due to this coloring, they are often mistaken for wasps or bees; they exhibit Batesian mimicry. Despite this, hoverflies are harmless. On occasion, hoverfly larvae have been known to cause accidental myiasis in humans. This occurs when the larva are accidentally ingested on food or from other sources. Myiasis causes discomfort, pain, or itching, however, hoverflies do not normally prey upon humans and cases of myiasis from hoverflies are very rare.